Contemplating your next tattoo design? Consider bacon. That’s right. I said bacon. Apparently there is such a thing called the “Royal Bacon Society” and they’re having a contest. Here’s how to “pork-ticipate” (come on. Yuk it up, people! 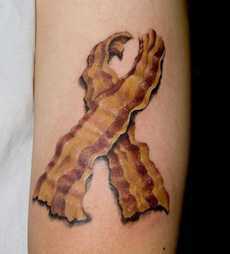 ): Submit your most beloved bacon images to the Bacon Society (I’m honestly laughing as I type this). The Society will choose its favourite images and then members will vote for their favourite one. The husband of bacon-of-the-month-club owner and avid bacon blogger Rocco “Boss Hog” Loosbrock will get it somewhere on his body in tattoo form. Click here to submit your bacon photos. Genius. Freakin’ genius.